The Regional Planning Commission has evolved over the past five decades addressing evolving community needs through the development of novel initiatives and strategic partnerships. 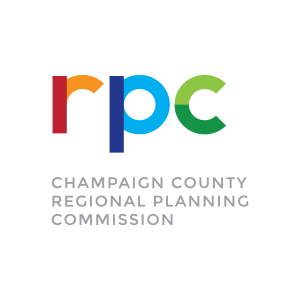 The Champaign County Regional Planning Commission was created on December 1, 1966. The staff of five had offices in Champaign County’s former Bennett Street building. At its creation, the Commission was the planning, zoning, and subdivision agency for Champaign County and the cities of Champaign and Urbana. The Commission initiated the U.S. Housing and Urban Development (HUD) Comprehensive Planning Program for Champaign County. The Regional Planning Commission was awarded federal HUD 701 planning funds that allowed for the development of a comprehensive plan for Champaign County. In 1974, the Commission was designated as a Metropolitan Planning Organization (MPO). A Metropolitan Planning Organization (MPO) is a federally mandated and federally funded transportation policy-making organization that is made up of representatives from local government and governmental transportation authorities. The Champaign Urbana Urbanized Area Transportation Study (CUUATS) was established from the MPO designation. From 1974 to 1976, the Regional Planning Commission was the administrator of the Comprehensive Employment and Training Program (CETA) for Champaign, Piatt, Ford, and Iroquois Counties. CETA utilized public service employment funds for small construction and maintenance projects. Out of this original effort, the local Workforce Investment Board was organized and funded. In 1974, the Regional Planning Commission was designated as the U. S. Bicentennial agency. Based upon the open space element, the initial Boneyard Creek plan was developed and adopted by Champaign, Urbana, and the University of Illinois. In 1977, based upon the housing element, the Regional Planning Commission prepared the Model Landlord Tenant Ordinance, leading the creation of the C-U Tenant Union. In 1978, based upon the housing element, the Regional Planning Commission developed its Community Development Program area. Commission staff developed the Community Development Block Grant (CDBG) plans for Champaign, Urbana, and Rantoul and operated the CDBG program for Champaign County. This was the Commission’s first major federal grant award with annual funding in excess of $3 million per year for low-income housing rehabilitation, public infrastructure, and economic development. This expanded initiative serving low-income residents provided the opening for the Commission to begin delivering social services on a broader scale. This was the era of New Federalism. Legislation enacted during this period shifted the responsibility of many social programs from the federal government to the states. This shift primarily affected health care, cash assistance and other income benefits, family structure, childcare, immigration, and long-term care. In 1980, the Commission moved to the former Webber School and had a staff of 20. In 1981, as the Commission’s reputation for successfully developing grant proposals and funding grew, staff administered housing and public facility grants throughout a 16-county region in Central Illinois. In 1981, as the Commission’s expertise in developing successful grant proposals and funding grew, staff administered a myriad of housing and public infrastructure grants throughout a 16-county region in Central Illinois. In 1983, the Commission was award federal funding to capitalize the Community Development Assistance Program (CDAP) revolving loan fund. In 1983, East Central Illinois Police Training project was transferred to the Regional Planning Commission. The Community Services Block Grant (CSBG) program grew out of the new federalism legislation. This grant provides federal pass-through funding to the state for a variety of social service programming. In 1984, the Regional Planning Commission became the designated Community Action Agency for Champaign County. This designation enhanced the Commission’s ability to successfully secure additional federal and state funding for low-income, at-risk individuals. These funds increased in the late 1980’s allowing a dramatic expansion of direct service programming within the Regional Planning Commission. In 1991, the Regional Planning Commission successfully securing initial funding to organize the Champaign County Community Development Corporation. This multi-bank CDC promotes small business start-up and commercial expansion and associated job creation by providing debt and equity financing. pendent service coordination for developmentally disabled persons, and county zoning. In 1994, the Regional Planning Commission secured funding for its largest program, Head Start, which provides comprehensive child development services to at-risk preschool children. In 1997, the Commission secured Early Head Start grant funding to serve infants and toddlers. In 2002, the Regional Planning Commission secured funding to start-up the Champaign County Geographic Information System (GIS) Consortium. The GIS Consortium was formed to secure the benefits of data collection and analysis on a countywide scale and to apportion the cost of implementation, maintenance, and data acquisition. Champaign County was designated at the lead member of the Consortium with the Regional Planning Commission was subsequently appointed as the administrator and fiscal agent of the program. In 2005, the County Planning and Zoning Department, a part of the Regional Planning Commission, became the Zoning and Enforcement Department. In 2005, the State awarded the Low Income Home Energy Assistance (LIHEAP) and Weatherization grants to the Regional Planning Commission. In 2006, the Regional Planning Commission securing federal funding to form a six-county Economic Development District. During this decade, CUUATS emerged as a national model for multi-modal transportation planning, resulting in national recognition and awards. The Commission expanded its Head Start and Early Head Start programs by establishing two new center-based sites and becoming a national model for community collaboration and partnerships. During this decade, the Regional Planning Commission expanded its services to the homeless, youth, and families and initiated the court diversion project in Champaign County. The Regional Planning Commission became the employer of record and fiscal agent for the Summer Youth Employment Program. The State awarded over $2 million in workforce development funding for expanded services to adults, youth, and dislocated workers in our region. The Youth Assessment Center was established and funded through the quarter-cent public safety tax. The Regional Planning Commission received funding from the U.S. Department of Agriculture to capitalize on an Intermediary Revolving Loan Fund allowing small communities the ability to execute public infrastructure projects. The Regional Planning Commission has led the Continuum of Care initiative and developed a centralized intake model for homeless services. Champaign County’s Head Start program achieved National Association for the Education of Young Children accreditation. State Preschool for All funding was secured to provide enhanced early childhood services. In 2017, the Commission successfully secured Preschool for All Expansion grant funding resulting in additional service provision to over 107 children and families in a new nine-classroom learning facility in Urbana.